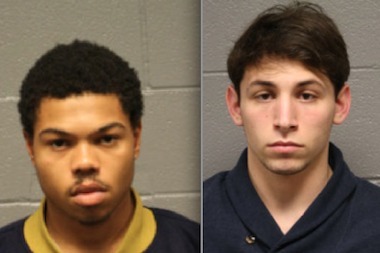 Chicago rapper Taylor Bennett, 18, and Jake Kalmin, 21, are charged with aggravated battery for beating a man who accidentally stepped on Bennett's foot, prosecutors. COOK COUNTY CRIMINAL COURTHOUSE — Michael Taylor Bennett, brother of Chance the Rapper and an up-and-coming entertainer in his own right, is charged with beating a drunk man at a college party after the man accidently stepped on his foot, prosecutors said. Bennett, 18, and his friend Jake Kalmin were at a party in the 2200 block of South Michigan Avenue on Sept. 28 when a drunk man stepped on his foot, Assistant State's Attorney Erin Antonietti said. With another guest pointing a cellphone camera at him, Bennett proceeded to beat the man, punching, kicking and stomping him, Antonietti said. Kalmin, 21, jumped in, prosecutors said. They left the man bleeding from the head and ran from the party, prosecutors said. 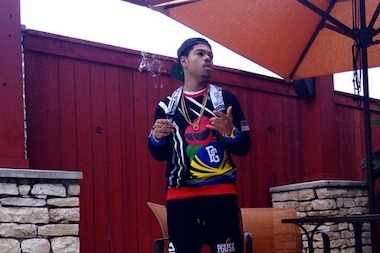 Chicago rapper Taylor Bennett, brother of Chance the Rapper, is charged with beating a man at a college party in the South Loop, prosecutors said. But friends of the victim, most of whom are Columbia College students, used the cellphone video to identify Bennett and track him down on social media, prosecutors said. Bennett, of South Prairie Avenue, turned himself in to police Thursday and was charged with aggravated battery causing great bodily harm. Bennett called Kalmin his manager in a Twitter post. The victim, a 19-year-old from Ohio, needed staples to close the wound in his head, prosecutors said. He was treated for a fractured skull and bleeding on the brain. The man continues to suffered from impeded speech and headaches, prosecutors said. An advocate of the campaign known by the hashtag #SaveChicago, Bennett is an advocate for violence awareness in Chicago, according to his Facebook page. Bennett's parents and his attorney, Jeff Fagan, declined to comment after a brief court hearing Friday. Fagan did say during the hearing that he disputes the allegations as laid out by prosecutors. Bennett's father, Ken Bennett, is a former aide to President Barack Obama and currently works for Mayor Rahm Emanuel as the director of public engagement. The mayor's office declined to comment Friday. Both Bennett and Kalmin were ordered held on $75,000 bond.